Achieving and maintaining a healthy weight is one of the best ways an individual can strive toward good overall health and avoid preventable medical problems. Controlling your weight is crucial to living a longer and more fulfilling life. It will also help you to cut down on your insurance costs. One of the easiest ways to lose weight is by making sure to eat properly portioned meals. 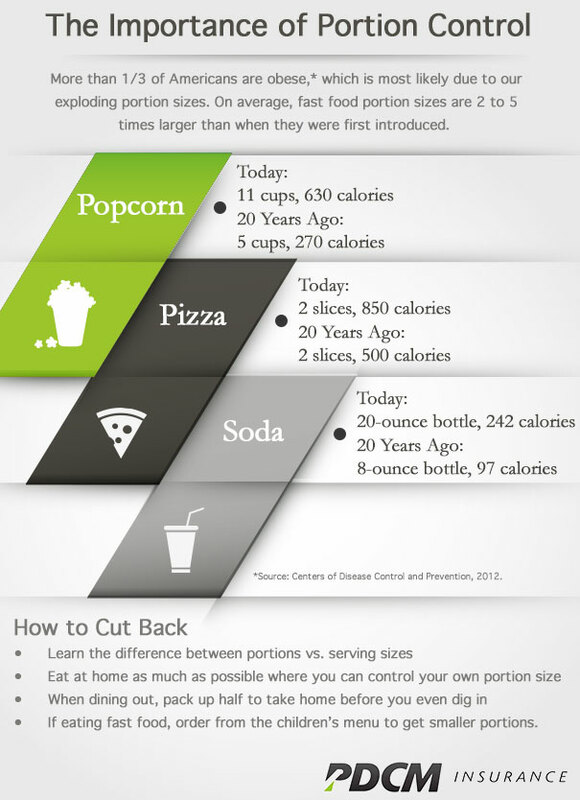 A portion is the amount of a specific food that you eat. There is no standard portion size for every individual. In contrast, a serving is a standard amount of food established by the U.S. Food & Drug Administration to advise individuals on how much to eat. Usually, restaurant portions are much bigger than traditional serving sizes which means excess calories. To avoid overeating at restaurants, opt for smaller portions such as lunch sizes or order from the kid’s menu. If this isn’t an option, ask your server to box up half of your meal right away so that you aren’t tempted to consume it all in a single setting. Did you know that if you burn an extra 150 calories each day, you can significantly reduce your risk of heart disease, high blood pressure, diabetes, colon cancer, anxiety and depression? To get an effective workout, you should exercise three to five times per week for at least 20 minutes. Work out at a pace that burns approximately 400 to 600 calories per hour. You should also try to get in at least two strength training exercises for each major muscle group two or three days each week with free weights or stationary lifting equipment. Remember to stretch every major muscle group for 20 to 60 seconds before and after each workout to reduce risk of injury. You can learn more about how weight management can improve your quality of life and insurance costs on the PDCM website at http://www.pdcm.com/health-insurance/individual/. If you have more questions about your well-being affects personal health insurance or vice versa, please feel free to contact Maria Drees or Liz Dejoode of PDCM Insurance, in Waterloo.